James N. Weiss received his medical degree and internal medicine training at the University of Pennsylvania School of Medicine. 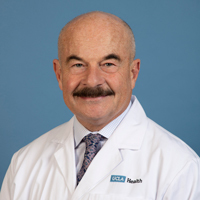 He completed his cardiology fellowship training at the UCLA 1981, including clinical electrophysiology training at the University of Maastricht, the Netherlands. He then joined the faculty at the School of Medicine, where he was director of Clinical Cardiac Electrophysiology from 1981-1985, and became a full professor in 1989. He became the Director of the Cardiovascular Research Laboratory and Professor of Physiology in 1996, and Chief of Cardiology in 2001. His research focuses on ion channel biophysics, cardiac electrophysiology, arrhythmias, and ischemia and mitochondrial biology. He leads an interdisciplinary group combining mathematical and experimental biology. He holds memberships in numerous professional organizations, including the American Heart Association, American College of Cardiology, the Heart Rhythm Society, the Biophysical Society, the American Society of Clinical Investigation, the Association of University Cardiologists.